The IPU10S vertical lifting clamp was designed specifically for the lifting, turning, moving or vertical transfer of stainless steel. You can lift sheet, plates, or fabrications from horizontal to vertical and down to horizontal (180º) as needed. The hinged hoisting eye allows for the clamp to place and lift the load from any direction, or with a multiple leg sling without damaging the clamp. 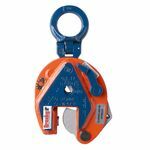 Need help connecting your IP10 or IPU10 lifting clamp to the hoist hook? Check out the new Crosby IP5000 Stinger Chain Assemblies. These handy units are built using alloy steel, and are designed to connect easily to your existing clamp--available in three sizes to accommodate clamps from 0.5T - 12T.